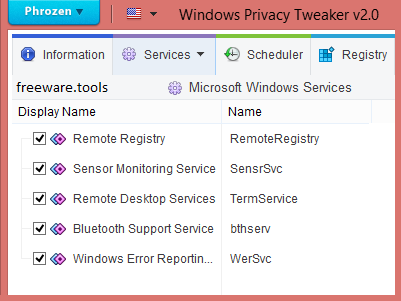 Windows Privacy Tweaker is a freeware tool that disables telemetry and tracking services in Windows 10. The program is broken into 5 tabs. Information is just that. Services shows you anything that runs as a service, Task Scheduler shows you anything scheduled, registry shows you what runs from the registry and finally a USB Security tab set your thumb drive to Read Only or Disable completely. It uses a simple red and green to let you know what is considered safe or not safe. This tool can also detect some privacy issues for Windows Vista, Windows 7 and Windows 8/8.1. Although an indisputable giant leap forward in human evolution, Internet and the ability to reach any user on the globe via an online connection has also meant that private data can be collected and stored without users even knowing it. Ensuring Windows Vista and later privacy settings are up to scratch can be done using Windows Privacy Tweaker, a practical utility that can enable or disable many built-in OS functions. The program does not require any installation and users are faced with an intuitive and efficiency-geared interface. However, you are prompted to create a system restore point before applying system tweaks, as some changes might render some applications or the entire OS unusable. Adjusting settings is performed via simple enable/disable buttons, which are also color marked, so as to draw attention to potentially unsafe situations. The application is built with Windows 10 in mind, although it can be employed with good results with Vista or later installments. Once launched, three tabs store the essential information, with targets for the process being the Windows services, scheduled OS tasks, and registry items. "Uncheck all" and "check all" options can be used to quickly apply batch modifications to all the entries in any given tab. It should be noted that the program will not attempt to modify any other settings than the default privacy options. Therefore, it will not root out potential registry exploits from third party programs, or expose and fix scheduled malware applications. Each tab lists the default Windows components that impinge on one's privacy and among the entries one finds Xbox data synchronization services, customer experience improvement program dependencies (DiagTrack), Cortana-related settings, data collection (DcpSvc) and sensor service options, along with other telemetry or biometric registry entries. Additionally, Windows Privacy Tweaker can control applications’ access to location, camera, and other settings, tools, or devices, disable Microsoft ads and block Bing searches. Several command line parameters can be used for more advanced operations, such as 'fix all the privacy issues' or 'revert to default'. In conclusion, Windows Privacy Tweaker is a simple utility for adjusting many of the Windows built-in security settings. The program can target system registry entries, scheduled operating system components, as well as Windows services.